I am grossly aware of my silence this year on my blog, but rather than beat myself up over what I could have done and should have done, I am moving on…resurrecting my ‘inner writer’. Today, March 1, 2015, the class kicked off the Two Writing Teachers‘ “Slice of Life Classroom Challenge“. Earlier in the year, your child set up a personal blog in which to express their autonomy and creativity as budding writers. As blogs provide a platform in which a writer can engage with an authentic audience, joining the Slice of Life Classroom Challenge presents an opportunity to reach out to other young authors around the world. Each day in the month of March, students are required to post a slice of their life. This ‘slice’, from past or present, can be in the form of a memoir, anecdote, journal entry, opinion piece, poem…basically, whatever suits the author’s fancy as long as it represents a ‘slice’ of their life. As writing is a form of self-expression, this is a perfect opportunity for students to try on their voice and shout out to the world what they want it to hear – an opportunity to wallow in the words of memories, of experiences. To support the students, I too am taking part in the Slice of Life Story Challenge (for adults), which means I will be writing alongside the students. This is a challenge on many levels. I love to write, but I am a ruminator that agonizes over every word which under the time constraints, will force me to write more fluidly. Also, I enjoy conferencing with students about their writing, but in order for me to model myself as a writer, I will have to squeeze conferencing in at another time. Although not ideal, I feel these bumps and bruises are worth the end result – producing motivated, passionate writers. Writing every day may cause some anxiety, so to further support the students, I will provide a mentor text each day focusing on a particular type of writing and/or writing technique. Students then have the choice to model their writing for the day after the model, or branch off on their own. You can offer encouragement by talking with your child each day about possibilities for future slices as well as reinforce the idea that published writing is fully developed and polished. All advice and editing is not only encouraged, but welcomed! To view your child’s posts, please visit our classroom blog, Wonderland. The home page of the blog, features my musings. The sidebar on the right features student blogs. Simply scroll down to find your child’s name and click on the link to read their voice. Everyone loves an audience, so if you have time, please feel free to leave a comment on a post of your child’s blog and perhaps another child’s post. Thank you for your continued support in fostering the young minds of the world. Over the past few weeks, your child and I have been working towards establishing a collaborative community. A community that allows one to remain autonomous while contributing to common understandings and goals. As many of you have likely heard from your child, Alice in Wonderland is a favorite novel of mine. I believe the middle school years are a Wonderland of sorts that one has to learn to navigate while not really understanding who you are; a tough terrain to traverse for certain. Throughout this tumultuous journey, it is my hope that we not only support each other through the bumps, but also push each other to attain heights we thought were not possible. Below is my educational philosophy inspired by Alice and the residents of Wonderland. I apologize to the parents that viewed this post last year. I look forward to meeting you at Open House. Many know Lewis Carroll’s Alice. As a youngster, I lay in bed, stealing a peek into her strange world. A world in which white rabbits ran about stressing over time, mad hatters hosted crazy tea parties, cheshire cats grinned impishly, and queens threatened to cut off your head. No wonder Alice had trouble making sense of herself in this odd universe. Alice’s resizing and struggle with her identity symbolizes the difficulties associated with growing up. Her identity displaced as she searches for her niche in a strange world. Middle school students, like Alice, fall down the rabbit hole, and emerge in a strange world, a world in which they struggle to define their autonomy in an increasingly academic world. This is not an easy world for adolescents or their educators. As an educator of twenty plus years, I believe it is important to help students feel efficacious in their efforts to succeed in the Wonderland of school. Efficacy requires a set of strategies that encourages students to tap into and make use of internal resources which allow them to develop and implement a plan to succeed. I believe a collaborative classroom that nurtures students to become independent, critical thinkers is integral to student success. I believe cultivating collaboration empowers students to not only find their own voice but also find the voices of others. When the classroom environment is designed to build a sense of community in which students seek resources within the group and value collective work, it is understood that collective effort is more effective than individual effort. Such an environment fosters flexible thinking; students know when to integrate and when to assert their ideas and opinions thus creating a cohesive community. Falling down the rabbit hole for most middle schoolers involves their struggle with asserting their individuality in an environment where social conformity seems to be the norm. It is important that students feel independent yet are part of a greater community. 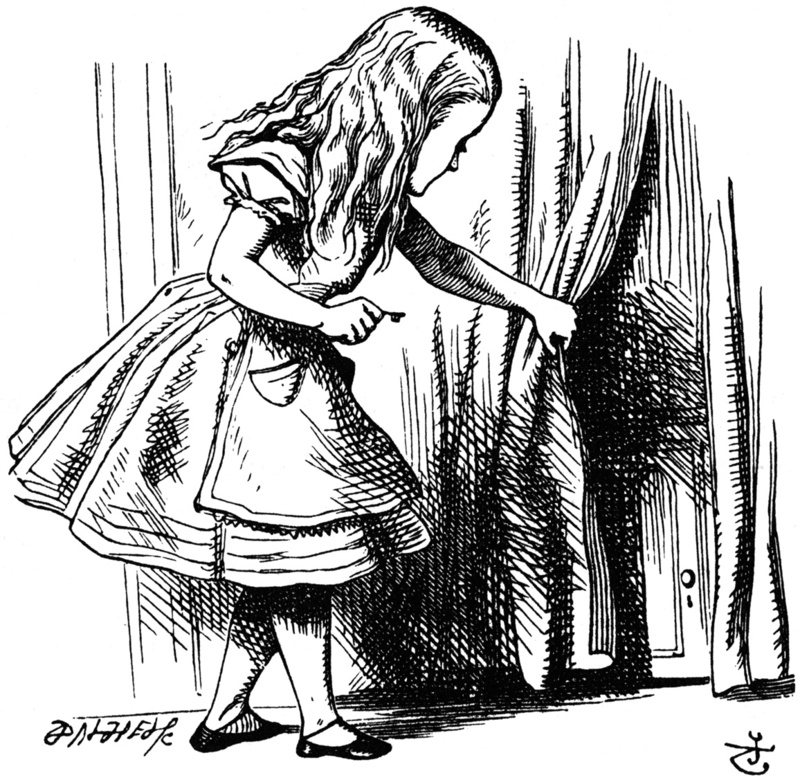 Alice’s curiosity was a catalyst for her many questions. She certainly was not afraid to point out the idiosyncrasies of Wonderland; in fact she was willing to risk beheading to state the absurdities of the Queen’s laws. Like Alice, middle schoolers require a curriculum that sparks curiosity and begs analysis; although without the risk of losing one’s head. I believe it is important to promote critical thinking in the classroom. As educators, it is imperative we create an environment that cultivates qualities such as questioning, gathering and assessing information, interpretation, open-mindedness, and effective communication in solving intricate problems. Teaching is a challenging profession that requires passion, patience and perseverance. I readily accept the challenge of providing students with a safe, collaborative environment that encourages independence of thought and introduces tools to help them articulate their thinking because I know it will help them thrive in the adolescent wonderland of education. I am excited to begin another year of wonder and discovery with my students! I relish words. I like palatable words that roll off your tongue and linger on your lips such as piquant, exquisite, delectable and scrumptious. I like contemplative words that create connections and challenge ideas such as ruminate, cogitate, elicit and kindle. I like elegant words that pirouette round a page luring you in such as beguiling, captivating, spellbinding and mesmerizing. I like cosy words that invite you in and embrace you such as hospitable, solicitous, tender-hearted and benevolent. I like empathic words that lend an ear and a heart such as compassionate, kindhearted, tender and philanthropic. Words open doors. I hope to share my love for words with your child this year so they too can be an opener of doors. * Inspiration drawn from New York copywriter, Robert Pirosh’s cover letter to Hollywood executives found in Shaun Usher’s Letters of Note. Yet another year has raced by leaving me breathless with nothing but an empty classroom and ruminations. Reflecting over the past months, thoughts of a kaleidoscope linger in my mind. Many of us can recall gingerly raising a kaleidoscope to our eye with eager anticipation of the beauty that would be revealed with each slight turn. Fascination held us in its grip as we tirelessly tested the infinite delicate patterns of color bursts – wondering if the next rotation would create a pattern of even greater beauty. Kaleidoscope literally means “observer of beautiful forms” reigning from Greek roots kalos meaning “beautiful” and eidos meaning “shape” plus skopein “to examine, or look at”. While looking at objects at the end of two mirrors, Scottish scientist, David Brewster (1781-1868) , discovered that patterns and colors were altered and refashioned into beautiful new designs and thus the world was gifted with kaleidoscopes in 1816. And so I am reminded of my year with your children. No matter the twists and turns middle school presented to your children, they never stopped refashioning these challenges into beautiful new designs. And I, was fortunate enough to be the observer of these beautiful forms. I wish they believe their voice is important and valued and should be shared with the world, as the world needs multiple voices to effect change. I wish they understand that mistakes are necessary in shaping who we are and who we want to become. I wish they value all, understanding community helps create greatness. I wish they see the beauty in themselves and allow this beauty to help them persevere through and rise above life’s challenges. I wish they develop confidence to share with the world who they are and what they believe in – to share the beauty I have observed within them. Although I am sad our time has come to an end, I understand that it is time others receive the opportunity to observe the continued beauty your children will create with a new rotation. Thank you for your support this year, and most importantly, thank you for sharing your beautiful child with me. It was indeed a kaleidoscope year! I was unable to capture all the conferences; I missed a few while conferencing with others. My apologies. I distinctly remember standing before you in August claiming that I would publish the goings-on of the classroom on a weekly basis. What happened? Already, the end of the year is whispering in my ear, reminding me of my gross shortcomings. So despite the enormous lapse in time, I take a deep breath and jump in to write this blog post. Communication with Extraterrestrial Intelligence (CETA) is still waiting for a message from alien lifeforms. Leap day takes about four years to come around. Waiting for a blue moon might take 2-3 years. Depending on the altitude in which they live, black alpine salamanders wait for their young to be born from two to three years. Additionally, an elephant’s gestational period is close to two years before the opportunity to nuzzle their young is possible. Since the cartoon the Jetsons, we have patiently been waiting for flying cars, meal pills, antigravity, jumpsuits and teleportation. It may take a month or more of waiting for your child’s teacher to publish a blog post. As author Richie Norton states, “No more tomorrows. Today is the day.” Hard to procrastinate if you live by this mantra. Despite my silence on the blog, your children have not been silent. Here is a summary (albeit lengthy) of what they have been up to since the last post. Students researched a country’s history of natural hazards and the impact these hazards have on the country’s lenses of sustainability (environmental, economic, and society). NGO’s were then researched to determine which would best help their country become disaster prepared to reduce risks. Findings were compiled into a written proposal and a visual presentation prepared to present to the UNISDR panel (group of teachers) in a bid to receive funding to implement disaster preparedness programs. See a sampling of the end results below. Watching the final presentations filled me with great pride. Students were poised, articulate and well-informed. It was, indeed, a moment to savor. If you would like to peruse some written grant proposals, take a look at China, Philippines and India. To determine which hypothesis, if any, was accurate, students had to prove the morphemes. Students brainstormed words that used the identified suffix(es) to check their theories. Once satisfied with the accuracy of the word’s affixes, students moved onto determining the base. Here they used Etymology Online to determine the root. Proving the base element was most challenging as the students were reticent to let go of their theory that <gate> was the base element. Progress was stunted because many were looking for what was familiar, a word they recognized, in <mitigation>. I found it extremely challenging to allow students to make mistakes without giving them hints of how to find the correct answer. Sounding like a broken record, I continued to ask students to prove their theories and asked about connections between the etymological root of the word and the denotation. With determination, students found <mit> as one base element coming from Latin mitis meaning “gentle or soft”. With reluctance, students let go of the idea that <gate> was another the base element, however they needed guidance in the end to uncover the second base <ig> coming from the Latin root agere meaning “to do, make or act”. This was an exciting find as they connected this root to the one they uncovered in <proactive>. Meaning, base elements <act>, <ig>, <ag> all come from the Latin root agere. Investigations were recorded on a poster. Next, we will be studying words related to dystopian societies. Once students completed their March Slice of Life Story Challenge, we paused our blogging to work on the craft of writing and produce a piece of more substance. When visiting author, Jack Gantos was here, he claimed, “We are all full of really good stories.” Taking his advice, students started their narrative with a small moment of their life and then stretched it out using magnified moments, internal monologues, dialogue and show, not tell. Through several focused rewrites, students revised their beginning, strengthened their word choice, varied sentence beginnings and lengths, added figurative language, applied other literary techniques such as alliteration or repetition, and finally, tightened their ending. Before hitting the publish button, students edited their conventions and formatting. What you see published, is purely student work. They are proud of their accomplishments, as am I. Writers need an audience, so I need your help. Please take the time to read your child’s narrative as well as two others and leave a comment sharing what spoke to you about their story. Your time and attention to this matter is much appreciated. You can find the student blogs on the right hand sidebar of my Wonderland blog. As I am writing alongside the students, my personal narrative, Childhood Stupidity, is my latest post. Currently, students are engaged in reading a dystopian novel of their choice. The term ‘dystopia’ was coined by the British philosopher John Stuart Mill. According to Wikipedia, J. S. Mill first used ‘dystopian’ in a speech before the British House of Commons in 1868 regarding the government’s Irish land policy: “It is, perhaps, too complimentary to call them Utopians, they ought rather to be called dys-topians, or caco-topians. What is commonly called Utopian is something too good to be practicable; but what they appear to favour is too bad to be practicable.” A life of destitution, tyranny and terror is summoned when visualizing a dystopian society. Dystopian fiction, although set in the future, explores modern issues that have reached drastic proportions producing nightmarish conditions. Corrupt governments convince their people society is fair and sound, a utopia, not the dystopian community it really is. Dystopias are written as warnings – reminders that humankind must tread carefully to prevent such chaos from becoming a reality. The protagonists of dystopian fiction are dissidents, standing up against oppression for the greater good; teaching us that it is important to be an upstander and make a difference. Students stand alongside the protagonist, soaking up their empathy for others and courage to stand up for what you believe in. As Neil Gaiman states, “Fairytales are more than true; not because they tell us that dragons exist, but because they tell us that dragons can be beaten.” As students help the protagonist “slay the dragons” of these dystopian worlds, they learn their dragons can also be slain. Students are taking part in Socratic seminars and threaded discussions to dialogue about the provocative themes that are emerging in their novels through setting, character and plot development. Here is a sneak peek into a threaded discussion on Lois Lowry’s novel, The Giver and another threaded discussion on the second book in her series, Gathering Blue. To view a discussion, click on the COMMENTS button in the top right hand corner of the document and all will be revealed. That’s it for now. I will try not to let so much time lapse between posts, although my word is a bit suspect based on my actions. Global citizens can be defined as problem solvers that are future focused. They understand growth is necessary for both the individual and the community in order to promote continued progress. They understand that to make the best possible progress, it is important to be proactive. To determine which hypothesis was accurate, students first had to prove the morphemes. Students brainstormed words that used the identified prefix and suffix to check their theories. Once satisfied with the accuracy of the word’s affixes, students moved onto determining the base. Here they used Etymology Online to determine the root. Many groups looked up <active> because they were certain <pro-> was a prefix. Some looked up <act> because they were certain <-ive> was a suffix. Etymology Online uncovered <act> as the free base element coming from Latin agere/actum/actus meaning “to do; set in motion.” This left students with the correct word sum of <pro + act + ive> –> proactive, which they quickly connected the meaning of the root to the dictionary definition stating proactive meant to set something in motion before it becomes a problem. Good thinking. Finally, they were challenged to find as many related words to <act> as they could, showcasing their thinking in a word web. We are close to wrapping up the Impacts Unit. Students are making final additions and revisions to their written proposals asking the UNISDR to fund their country’s disaster risk reduction plan and finalizing their visuals for Thursday’s and Friday’s presentations. To ensure both the proposal and presentation are effective, students learned about Aristotle’s rhetoric – the three means of persuasion: logos, pathos and ethos. In their final rewrites, students are looking to inject emotional anecdotes, supporting statistical data and credible sources into their proposals to feel confident their appeals are persuasive. To help your child prepare for the presentation, please allow them to practice the art of persuasion on you. The students have placed so much hard work and effort into this project; they should be proud of their accomplishments. I know I am proud of them. And all the while, students continue blogging. Please check out their voices on our classroom blog, Wonderland. Student links are on the right sidebar. Currently, students are well into the integrated Impacts Unit in which they have been studying the patterns of natural hazards within a country and working on developing a proposal to persuade ‘representatives of the UNISDR’ to fund a disaster risk reduction program for their assigned nation. Goal: Your goal is to secure funding for your country for disaster risk reduction. Situation: As a UN member state located on the Ring of Fire, your country is potentially at risk for an earthquake and/or tsunami. You need to persuade the UNISDR to fund disaster preparedness in your nation. To build the background knowledge necessary to develop a disaster risk reduction proposal, science classes have had students research plate tectonics and the Ring of Fire – analyzing the ‘why’ and ‘how’ behind the natural phenomena resulting from the earth’s shifting plates. In math, students analyzed statistical data of their country’s natural hazards to identify predictive patterns and formulate generalizations about their country’s need for disaster risk reduction. While in Humanities, students have been researching and synthesizing their understandings of the geographic profile of their country, the impact a historical natural disaster had on their country’s economy, environment and society, and NGOs that provide aide in a disaster as well as disaster risk reduction programs. This week, students will be culminating all these understandings into a written proposal as well as planning and creating their mode of presentation. This unit has presented many challenges for the children as they have had to tackle difficult scientific and mathematical concepts as well as formulate their understandings in the abstract form of writing, all while working collaboratively. This is no easy task, as they are learning to listen to, consider, and compromise their ideas collectively. I am proud of their display of flexibility and diligence. We continue on with our second week in the March Slice of Life Story Challenge. Some students are thriving at the opportunity to write every day, some are struggling. The goal is to write about a slice of life every day in the month of March, but if your child is distressed with the pace, encourage them to write 2 or 3 posts a week rather than 7. I will be having this chat with them on Monday. To offer support and encouragement, I write a slice every day along with the students on our classroom blog, Wonderland. Once I post my daily slice, the students post their slices in the comment section of my post. Please feel free to click on the slices and leave a positive comment on their writing. Everyone loves an audience! If interested, you can view my two slices, “Dear Students” and “Power of Words” that summarize the wise words of last week’s visiting author, Jack Gantos. What a gift his workshops were! Recently, a reoccurrence of a childhood ritual has been tumbling around in my head. Having been raised Catholic, and attending a parochial private school, every Wednesday I was expected to squeeze into a wooden confessional, slide the small door open that revealed a mesh screen with a figure on the other side, and confess all my sins to the priest. To say I dreaded Wednesdays as a result, would be a gross understatement. As I rattled off the introduction of my confession, I scrambled to come up with my list of sins. This block was not a result of purity, rather the fear of telling the truth and revealing my true self to the priest. Truly, I felt it was an act of mortification not confession. I’m certain, at this point you are wondering what this anecdote has to do with your children, well, I have been feeling the need to confess my sins to you. All I can say in my defense is that my absence is a result of attending to the needs of your children. I hope you absolve me from my sins. 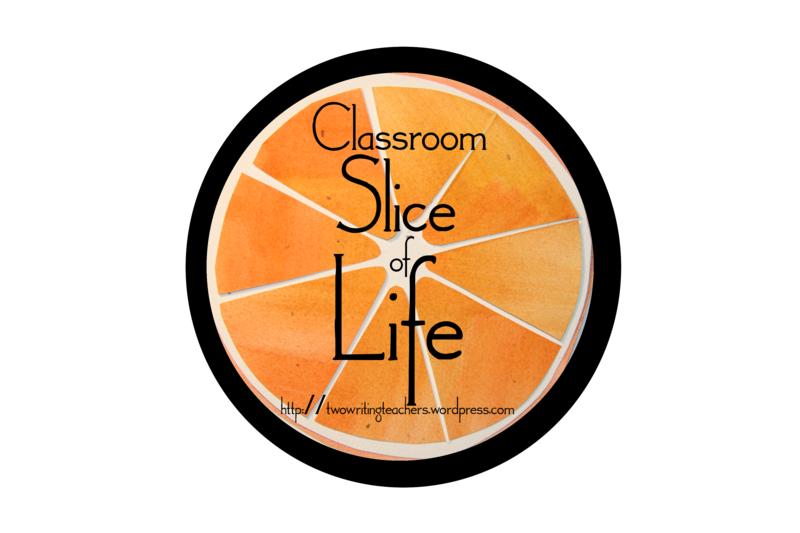 Today, the class kicked off the Two Writing Teachers‘ “Slice of Life Classroom Challenge“. Your children have set up a personal blog in which they can express their autonomy and creativity as budding writers. As blogs provide a platform in which a writer can engage with an authentic audience, joining the Slice of Life challenge presents an opportunity to reach out to other young authors around the world. Every day in the month of March, students are required to post a slice of their life. This slice can be from the past or present. The ‘slice’ can be in the form of a memoir, anecdote, journal entry, opinion piece, poem…basically, whatever suits the author’s fancy. As writing is a form of self-expression, this is a perfect opportunity for students to try on their voice and shout out to the world what they want it to hear. This is an opportunity to change the world with their words. To support the students, I too am taking part in the Slice of Life , which means I have to write along side the students every day. This is a challenge on many levels. I love to write, but I am a slow writer that agonizes over every word. I will have to learn to write more fluently. Also, I love to conference with students, but in order for me to model myself as a writer, I will have to fit conferencing in at another time. Although not ideal, I feel these bumps and bruises are worth the end result – producing motivated, passionate writers. If interested in what your child is blogging about, please visit our classroom blog, Wonderland. The home page of the blog, features my blatherings. The sidebar on the right features student blogs. Simply scroll down to find your child’s name and click on the link to read their voice. Everyone loves an audience, so if you have time, please feel free to leave a comment on a post of your child’s blog. Thank you for your continued support in developing the young minds of the world. Think. It seems a simple task. According to the Oxford dictionary, to think means to use one’s mind actively to form connected ideas; to have a particular mental attitude or approach. As simple as the definition is, teaching ‘thinking’ is a complex undertaking. Despite its complexity, fostering critical thinkers should be a fundamental cornerstone in all classrooms. Over the past couple of weeks, students were faced with reading challenging articles on the conflict between China and Tibet conflict and synthesizing their understandings in a presentation to be shared with the class. To navigate the complex texts, students engaged in active reading strategies. PQRST is one of the strategies students used to make sense of the articles handed to them. This strategy requires students to annotate their questions, connections, and understandings as they engage in each step of the following process. When PREVIEWING, students are coached to pay attention to the features of a text – headings, subheadings, captions, diagrams, bold and italicized words. At this stage of reading, students begin wondering about the topic – making predictions about the content of the text. Following the previewing of the text, students focus on QUESTIONING. During this stage, I encourage students to turn headings and subheadings into questions to provide a focus, followed by a reading of the text, flooding it with questions that pop up as they work their way through the article. I advise students to be patient and embrace confusion at this stage as they attempt to formulate the gist of the text. The next stage reinforces the idea that multiple readings deepen understandings. Students are asked to READ the article once again, this time chunking the text – summarizing their understandings or noting connections as they go. Additionally, I encourage opportunities to discuss the text with a partner during this stage to further solidify understandings. SUMMARIZING follows reading. It is at this stage that I encourage students to make sense of their newly formed ideas by organizing them into a mindmap that categorizes and summarizes the information. At this point, students have interacted with the text multiple times helping them to move beyond understanding and form critical opinions about the content. It is at this stage that students may get into heated dialogue about the topic. This is my favorite stage of the process, as students demonstrate they have established a conclusion and can justify it with evidence and interpretations. When needed, to help prepare for an assessment, students can TEST themselves on their understandings by quizzing one another using the mindmaps. Although multiple readings, annotations and mindmapping may appear tedious, it is important students are offered ample opportunities to engage in these strategies. Malcolm Gladwell, author of Outliers, suggests that it takes 10,000 hours of practice to achieve mastery. I am going to need your help to reinforce these strategies, when applicable, to Humanities homework. Friday’s presentations on the conflict between China and Tibet provided evidence that the PQRST strategy was effective in developing an understanding of a complicated issue. Students were able to communicate to an audience their perspective of the issues and provide possible solutions based on their research. Of course the presentations were not without the usual bumps and bruises of awkward pauses, over-reliance on scripts, and factual inaccuracies at times, but overall students should feel proud of their accomplishments. I look forward to future presentations. 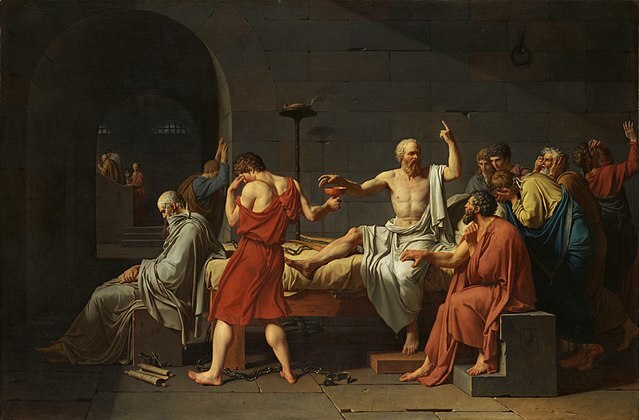 In preparation for our first Socratic seminar, students learned of Socrates, the father of Western philosophy, and his belief that genuine knowledge is gained only through questioning and dialogue. We spent time discussing the difference between dialogue and debate. The most significant difference being that dialogue is collaborative in which all members play an important role in constructing a common vision of shared truth and understanding. Whereas debate is oppositional; the goal being to prove the other person wrong. Vocabulary: Students might define unfamiliar words and note the author’s word choice – do the words carry positive or negative connotations? They might also research terms involving places or people to gain a more in-depth understanding of the content. Literary Elements: Students note how characters are presented, the setting described and its role in creating mood. They might also identify plot points and/or theme(s). Connections: Students note any connections they make to other texts, world events (historical or current), or self. Questions: Students craft a minimum of two questions to pose to the group. Questions must be provocative – causing others to pause and possibly rethink original viewpoints. Following their individual annotation of the text, students shared their thoughts with their table group and added to their annotations. For homework that night, students reread the passage one final time and made any further revisions and/or additions. We followed Matt Copeland’s, author of Socratic Circles, model of Socratic circles. The class was randomly divided in half. Half became the inner circle whose goal was to listen and construct a shared understanding of the passage. The other half became the outer circle whose goal was to observe the inner circle and reflect on their behavior of dialogue and offer suggestions for improvement. Each group was granted 10 minutes in each circle. Nervous bundles of energy clamored into the room on the day of the seminar. It took me a few minutes to reassure them – that it would seem less nerve-wracking as we they grow accustomed to dialoguing. We rearranged the classroom and students reluctantly settled in their circles. My role was to kick-off the conversation with a question. As the question floated from my lips towards the circle, it was met with resistance. After an awkward silence, one brave soul found their voice and spoke up. We were off. Despite the awkward silences, nervous giggles and shaking voices, students persevered. It was challenging for me to take a back seat and allow the students to work through their struggles; several times I wanted to swoop in and save them from the deadly pauses with a question or response. With great restraint, I refrained and they rose to the occasion and produced positive results. The inner circles developed a deeper understanding of Peak’s character and the theme of family and the outer circles provided specific, reflective feedback that will help students improve their dialogue skills. Students felt proud of themselves and hopefully, in turn, they realized the value of dialogue. Lesley Lambright (1995), another author of dialogue in the classroom, states students “are more creative when they are engaged in a group, listening to the thinking of others, watching the play of one idea bouncing off another, while being encouraged to dig below the surface of thought and feeling. Transactions spark the imagination.” Isn’t that what we want – to spark the imagination of students and watch them fly? I know I do. Sorry for displaying photos rather than video. I did film the Socratic circles; however, the quality of sound was so poor that the students couldn’t be heard.